Do you have any idea of how sweet, colorful and juicy is the watermelon juice? Have you ever tried to juice watermelon? Well… I can tell you that last week, in a Tuesday morning, my senses were pampered. So, like I said, Tuesday morning…I got up a bit earlier than usual. I opened the fridge, and there it was: one big sweet watermelon. It was exactly what I need it that morning…a juicy vibrant fruit. So I decided to juice it and to make myself a big jar of watermelon juice, for the 1st time in my life. I must tell you that I was both excited and curios. You put these 2 ingredients in the juicer and…there’s the juice…so please don’t say it’s hard or complicated, because you don’t have any excuse, ok? By juicing watermelon you increase your nutrients consumption. When you juice watermelon, the fruit is broken down and the juicer can extract a big quantity of liquid + a huge amount of minerals and vitamins. 3 pound of fresh watermelon core gives about 2.3 pounds of fresh juice. Imagine how much nutrition is found here, full dose of easy absorbable nutrients. Watermelon juice is rich in vitamin A, B1, B6, C, beta-carotene, lycopene, potassium, zinc, and magnesium. You can also add the rind and seeds when juicing for added nutritional goodies. 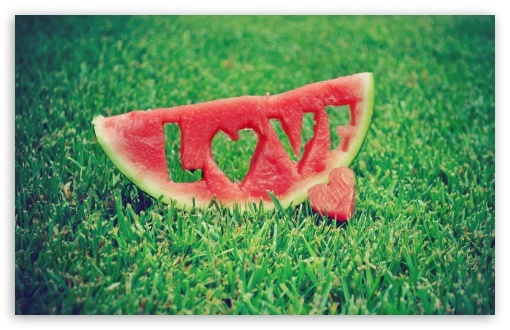 Watermelon juice helps protect our liver… BIG TIME, by its amazing alkaline effect upon our body. It does the same with all our organs and tissues, but it is well known for helping the liver in detoxifying itself. Watermelon juice helps in reducing muscle soreness after workout, by the same alkaline effect. Well… watermelon juice has some secrets, which were discovered thousands of years ago and are also known in our days. 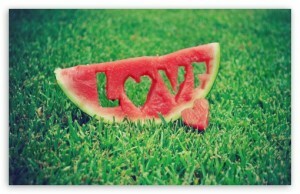 In the modern world in which we live, the watermelon juice is famous for his “VIAGRA” effect. It helps prevent the asthma, by his high content of vitamin C.
Helps with regulating high-blood pressure. Prevents cancer, by his alkaline effect + its amazing antioxidants resources. 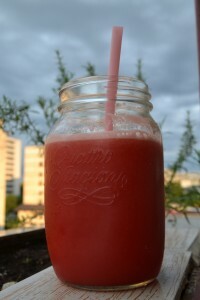 Watermelon juice helps the digestion in so many ways because of his high water content. It helps in constipation, gastritis, irritable bowel, promotes a regular bowel movement. This juice is amazing for inflammation… all kinds of inflammation, in any part of the body. If you drink watermelon juice regularly you will have a great skin, due to high content of vitamin A, you will benefit also from a great production of collagen due to vitamin C content and your skin will be young and happy! 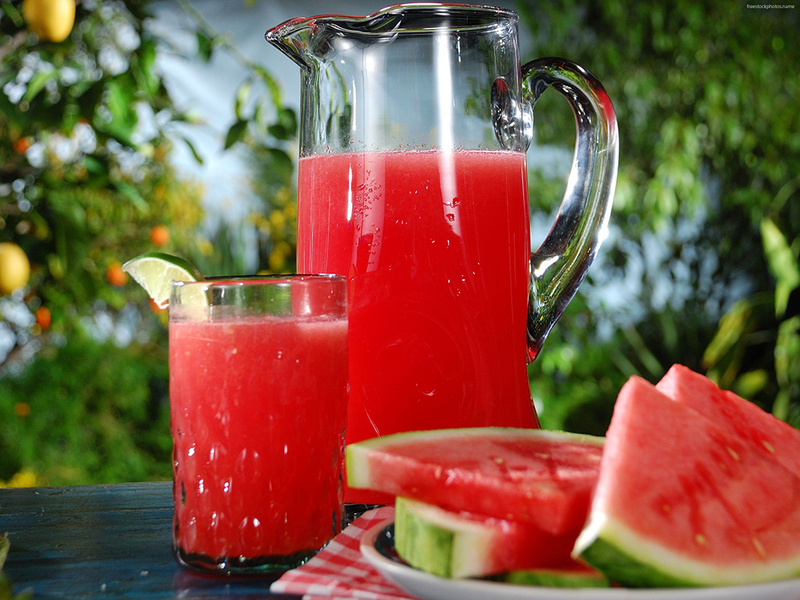 Watermelon juice boosts you with energy immediately, because it is very fast absorbed into the cells. Watermelon juice is your kidney’s best friend….EVER. It helps clean them from stones or sand, it washes them and offers a proper cleanse. As you can see watermelon juice has a lot of amazing health benefits, and in my point of view… no “black flags”. This means you can indulge with watermelon juice as many times as you wish. The only think that I recommend is to consume the juice on empty stomach or after 3 hours from your previous meals. Believe me, from experience, it is not funny to drink watermelon juice earlier than 3 hours after your meals. I hope I convinced you, at least to try it once… what you have to lose? Nothing!!! But you could gain some health and vitality in return. Let’s juice this big ball of… pure pleasure!